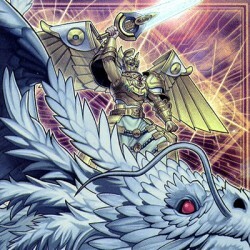 When this card is Normal Summoned: You can add 1 LIGHT Dragon-Type monster from your Deck to your hand, whose Level is less than or equal to the total number of "Lightsworn" monsters with different na..
During your Main Phase: You can send the top 2 cards of your Deck to the Graveyard, then, if any "Lightsworn" monsters were sent to the Graveyard by this effect, this card gains 200 ATK until the end .. This card gains 300 ATK and DEF for each "Lightsworn" monster with a different name in your Graveyard. During battle between this attacking card and a Defense Position monster whose DEF is lower than .. When you Tribute Summon this card by Tributing a "Lightsworn" monster: You can send the top 4 cards of your Deck to the Graveyard, then target up to 2 cards your opponent controls; destroy those targe..
Each time a card(s) is sent from your Deck to the Graveyard by the effect of a "Lightsworn" monster you control, except "Garoth, Lightsworn Warrior": Send the top 2 cards of your Deck to the Graveyard..
Once per turn: You can discard 1 card, then target 1 Level 4 or lower "Lightsworn" monster in your Graveyard; Special Summon that target. During each of your End Phases: Send the top 3 cards of your D..
During your Main Phase: You can return this face-up card from the field to the hand. During either player's Damage Step, when a LIGHT monster you control battles: You can send this card from your hand.. Cannot be Normal Summoned/Set. Must first be Special Summoned (from your hand) by having 5 or more LIGHT monsters with different names in your Graveyard. Once per turn: You can banish 1 LIGHT monster .. Cannot be Normal Summoned/Set. Must be Special Summoned (from your hand) by having 4 or more LIGHT monsters in your Graveyard, and cannot be Special Summoned by other ways. Once per turn: You can targ.. If this card is sent from the Monster Card Zone to the Graveyard: You can pay 500 Life Points to target 1 face-up monster you control; equip this card to that target. If the equipped monster attacks o.. If this card is in your Graveyard: You can return 1 face-up card you control to the hand: Special Summon this card from your Graveyard, and if you do, take 400 damage. Each player can only use the eff..
Once per turn: You can send 1 "Lightsworn" monster from your hand to the Graveyard, then target 1 other "Lightsworn" monster in your Graveyard; add it to your hand. Each time a card(s) is sent from yo..
Each time a card(s) is sent from your Deck to the Graveyard, place 1 Shine Counter on this card. All "Lightsworn" monsters gain 100 ATK for each Shine Counter on this card. If this card would be destr..